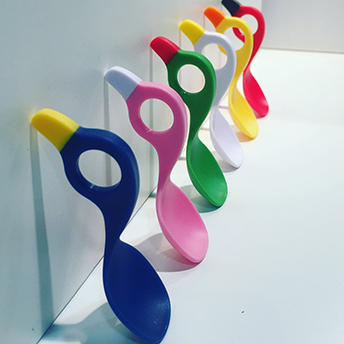 The can spoon has a world unique flat vertical grip, which rises from the table surface and allows the child to take the spoon with the “tweezers grip” with two or more fingers. 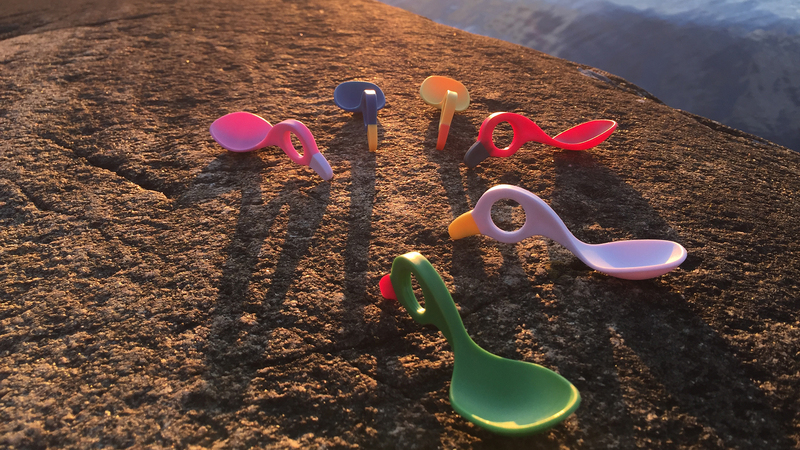 Many other childrens spoons encourage the use of the rather primitive whole-hand grip, a stable grip indeed, but it hardly encourages the development of motor skills as well as learning to eat. The hole can also be used (the child naturally chooses) that provides contact between the thumb and index finger for increased stability and if the child wants it, it may pierce the thumb or index finger for a secure grip. It gives the child good opportunities for development, less mess and, above all, a happier child. I can®, is a world unique Swedish invention that benefits children learning to eat. It enables children to hold the spoon better, and at the same time, stimulates dexterity development beyond what previously been possible. I got the idea because my two children, when they were younger, had problems dealing with the children spoons that were on the market. They spilled a lot and more food ended up on the floor than in the mouth. It was very frustrating. I had to find a solution and then I found one. No spoons in the market gave support for the precision grip, the I can® multi grip spoon were invented. To many spoons are made for the full handgrip with the spoon in the child’s palm. I can® has a world unique flat vertical grip, which enables the child to grasp it using the precision grip. 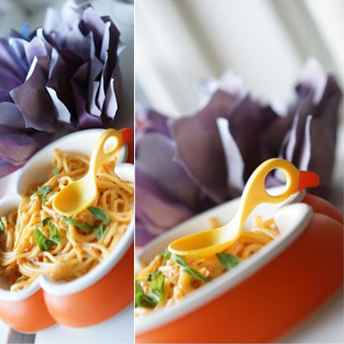 The hole in the spoon enables contact between the thumb and index finger, or if the child chooses it can put a finger through the spoon for stability. The child can use the lateral precision-, key-, finger-, transverse volar-, fivefinger- or through-thumb grip. That’s why I can® have the extension name Multi Grip and enables the child to also train their fine motor skills, which is important for their development. Consumer response states it works better than the spoons on the market. Mums just love it. A child that trains its precision grip will develop its dexterity better, and learn to eat quicker. This product is a revolution mostly because it trusts the child to be able to develop, rather than forcing a certain grip upon the child. Expert says – It is important early in life to have a positive experience of eating. Children wants to eat by themselves but don’t manage to do it. Recently a study in Sweden at Uppsala University states that: There is a clear connection for children with fine motor skills and their cognitive development. I can® is specially designed for children, encourage their fine motor skills and helps them to eat by themselves, which is important for their development. I can® encourage and stimulates children to eat in an easier way with less waste. I can® is suitable for small fingers. Light weight, small size and fun colours. All “I can” spoons are compleatly free of PBA, PVC and Phthalater. Commission Regulation (EU) No 10/2011, products in contact with food.